The moment you discover Tinywallet ads you must close your browsers and delete running adware. Even though online advertisements are no longer surprising, and you may be used to them if ad-blockers are not installed, not all advertisers are trustworthy. It is a must to remove Tinywallet ads because they may represent the parties you should not trust on any occasion. Unfortunately, many are mesmerized by the offers represented by the application and interact with them without any caution. This is about the worst thing to do. The disturbing ads will start showing up as soon as Tinywallet is installed onto the computer. The official website tinywallet.net does not offer a download link, which means that the program is distributed in some other way. In fact, the program has been created on the justplugit engine, which is why you can expect it to be distributed by Amonetize, InstallRex and similar third-party installers which have been used to spread other justplugit adware (e.g., Saveitcoupons and CouponAddon) as well. Of course, you have to delete any justplugit application. Note that if you delete Tinywallet, you will get rid of Tinywallet ads as well. 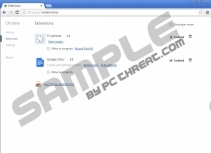 Tinywallet ads may show up on the most popular browsers which the program will be installed onto. If you find the application installed onto Google Chrome, you will be able to check its permissions. Unfortunately, these permissions are quite disturbing. It is suggested that adware will be able to manage the installed applications and read/modify your data on the websites you visit. This means that if you do not delete Tinywallet, it will spy on you, which may be used to present you with personally targeted offers. Of course, you may be unwilling to remove Tinywallet ads if they appear to be useful; however, we can assure you that this is necessary. You should not expect Tinywallet ads to save your time/money because the presented offers are most likely to be completely worthless. In fact, in some cases, you may click on interesting ads and discover that the promoted services are completely unrelated. Overall, you should stop wasting your time with the disturbing program and delete it right away. Sometimes the program leaves leftovers after the manual removal is conducted. Therefore, if you choose to delete Tinywallet ads manually (see guides below), you also need to remove the remaining files. You can evade this often complicated task by installing automatic malware removal software. Right-click on the screen of the Metro UI menu and in the new pane select All apps. In the Apps menu click Control Panel and then move to Uninstall a program. Locate Tinywallet, right-click it and select Uninstall. Navigate to the Task Bar and click the Windows/Start button to access a menu. Select Control Panel, go to Programs and then click Uninstall a program. Right-click the program you wish to delete from the PC and choose to Uninstall. Find the Start button on the Task Bar, click it and select Control Panel. Double-click Add or Remove Programs and the Change or Remove Programs menu will show up. Click the undesirable program once and then click the provided Remove button. Quick & tested solution for Tinywallet ads removal.